Crown Promenade Hotel Melbourne, modern style and comfort! 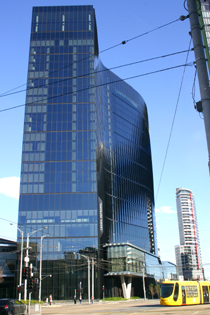 The Crown Promenade Hotel Melbourne is a 4.5 star modern hotel, the little sister to the luxurious Crown Plaza Hotel. It is located within the exciting Southbank precinct behind the Crown Entertainment Complex, and directly linked to this and the Yarra by Airbridge. Its rooms are spacious with floor to ceiling windows. Some of them with fantastic views overlooking Port Phillip Bay, or the Melbourne CBD and Yarra River - you need to ask for these! It is light, relaxed, stylish and affordable, has conference facilities, a restaurant and bar, and a much loved 25m pool with views of the city skyline. Many of its clients particularly appreciated for its location – right in the Southbank shopping and entertainment precincts and only a 10 minute walk from the city. They also like the service and room size, cleanliness and comfort. For secure bookings and guaranteed best prices, you can book the Crown Promenade Hotel here - No Reservation Fees! There is a tram-stop just outside on Clarendon Street, which will connect you directly with the city, and St Kilda on the other end of the tram line. Prices for Melbourne Australia Hotels vary according to the season and Melbourne events. Booking over the internet will give you a discounted rate. You can make a booking for good deals and last minute hotels Melbourne here.